Thursday night football will bring us the New York Jets vs. Buffalo Bills, both these teams had a tough start of the season last week; NY Jets lost at home 23-22 to the Cincinnati Bengals and Buffalo Bills fell 13-7 to the Baltimore Ravens, this being said it’s obvious that winning this match is very important for Jets and Bills alike, starting the season with two loses is not good for any team. 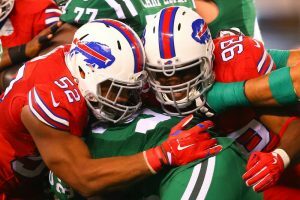 Jets’ Defense vs. Buffalo’s Offense? The Jets didn’t have a great preseason, but their defensive line is solid with Leonard Williams leading it, Sheldon Richardson will be back from his suspension (for a street racing arrest) and will be ready to play against Buffalo. Quarterback Ryan Fitzpatrick has to deliver a great game on Thursday, as he’s always had problems when facing the Rex Ryan’s defense… Fitzpatrick needs to find a different level of play to help his team get the win. Jets as a team need to come together and capitalize on the opportunities created by some of their players, there appears to be a disconnection in several areas and this is costing them, they are not being effective. Bills will be playing at home, and they have won the last five encounters they’ve had against the Jets, if you believe in stats, there’s that. But Buffalo’s offense looked horrible in their match against Ravens; QB Tyrod Taylor had the lowest total passing yards of any quarterback in week 1, hopefully this was just an off night, adjustments will be made and he will get his act together this Thursday. Wide receiver Sammy Watkins is still not at 100% as his foot injury apparently continues to bother him some; yet he has confirmed he will be OK to play on Thursday if he doesn’t or is not at his best this could mean more problems for Buffalo. Limiting the penalties is also something the Bills should work on as it was a huge problem in their game against Ravens. The line for Jets vs. Bills opened up at -2.5 for Buffalo, and is currently pk’em in most places, 64% of the bets are currently placed on NY Jets and when it comes to the total, it sits at 40.5 and most gamblers are picking the Under. I do like that Under and I believe the Jets have what’s required to finally get that win they want/need against the Bills, if you can get the Jets plus a point, take it. Join AceSportsbook.com and make the most out of the NFL 2016!